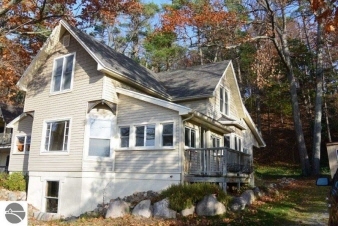 Description: Excellent location on the base of old mission peninsula offering outstanding west bay views. Home has historic character plus up north charm, 4-season sun room, plenty of knotty pine, tongue/groove vaulted ceilings, maple floors, solid wood panel doors. Living & dining have bay windows. Gas f/p, built-in bookcases. Office/library on main level. Kitchen w/butcher block counters, built- in table & the huge walk-in pantry is a cook's dream w/small fridge & sink, counters & shelves. Master walks out on private woodside deck. Stunning, massive bath on main level w/steam spa. Upstairs bath has beautiful mosaic tiles. Waterfront parks, restaurants, wineries, & close to downtown tc.